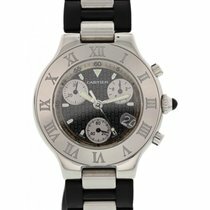 Details Men's Cartier Chronoscaph 21 watch. Round stainless steel 37 mm case. White chronograph dial with luminous hands and markers. Roman numeral bezel. White rubber and stainless steel band with stainless steel deployment buckle. Quartz battery movement. Sapphire crystal.